Sit back and relax in the hot tub! 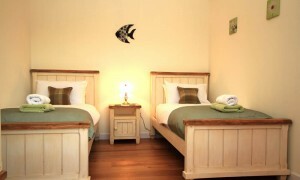 The accommodation comprises 3 bedrooms sleeping a maximum of 6 people. One King size double room with shower room downstairs, double bedroom upstairs and one twin room downstairs. There is an open plan sitting room/kitchen area. 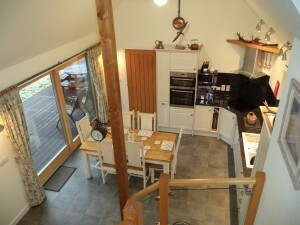 The kitchen has an oven and separate grill, microwave,dishwasher, ceramic hob and fridge/freezer. Patio doors open out from the kitchen onto decking which houses a picnic table, deck chairs and a barbecue. 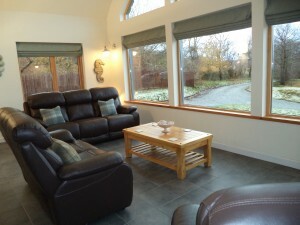 The downstairs sitting room has freeview TV and DVD player. The house also has recently installed air conditioning and free Wi-Fi. 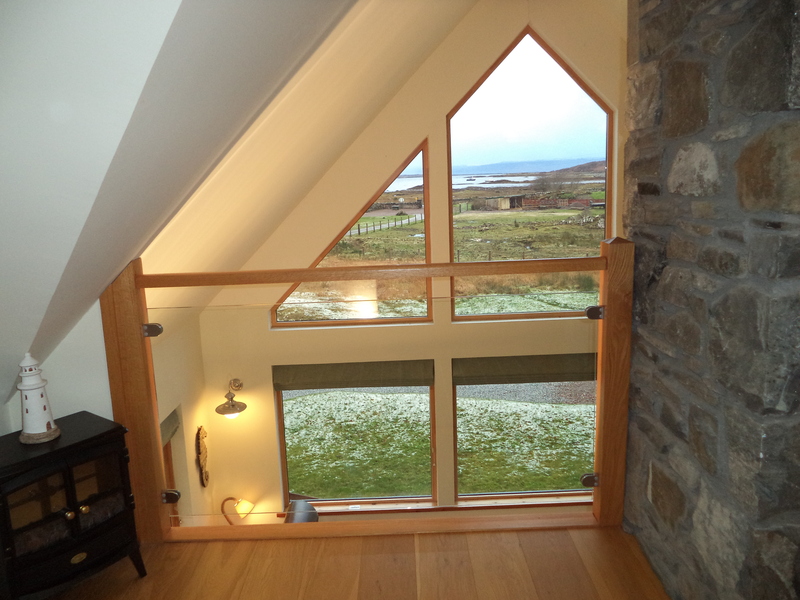 Underfloor heating throughout is contolled by a thermostat and for that extra cosy feel there is a woodburning stove. Logs are provided in a basket and extra logs can be supplied for a small charge. Upstairs there is a quiet cosy sitting area with superb views through a glass balcony. An Ipod dock,Cd player and radio are provided. There is a separate utility room with washing machine and tumble dryer. The main bathroom has a separate bath and shower. 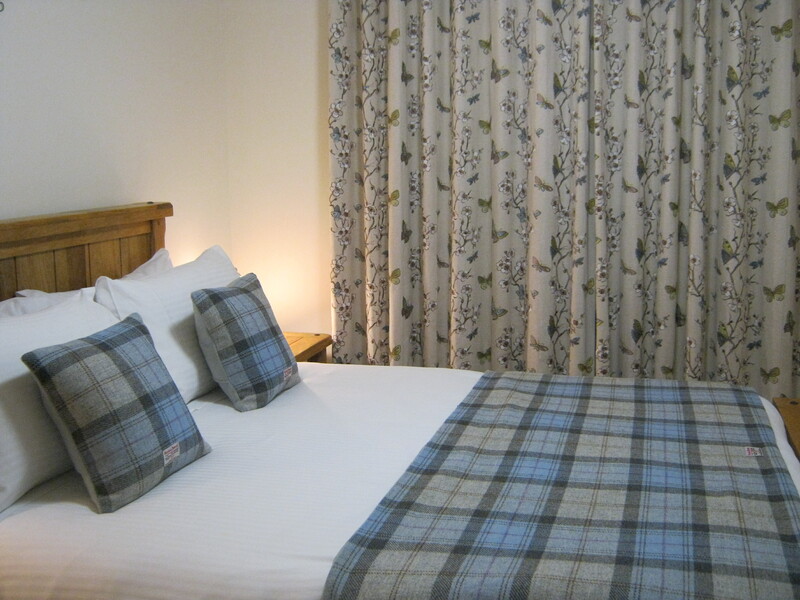 The king size double bedroom downstairs has a built in wardrobe, en-suite shower room and toilet. The downstairs twin bedroom has a lovely view onto the Isle of Eigg. 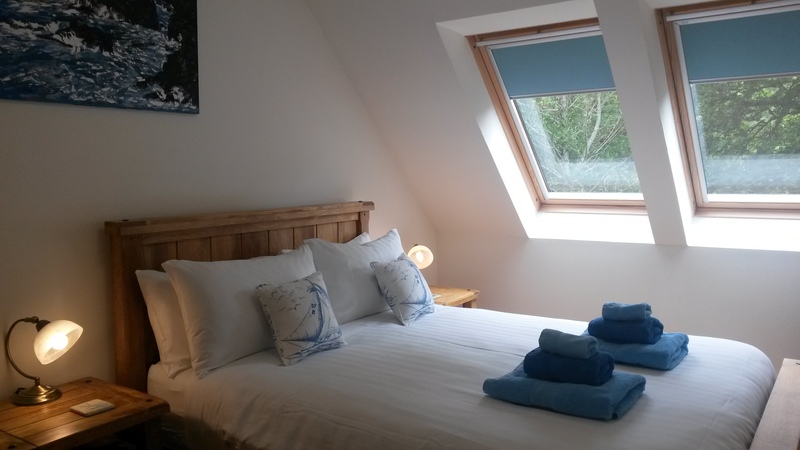 Upstairs bedroom has double bed and velux windows and access to upstairs sitting area. All bedlinen and towels are provided and electricity is included in the tariff. We can also provide a travel cot (please bring own bedding), a high chair and toddler small table and chairs. Sorry no pets are allowed as there are hens and ponies nearby on the croft but kennels are available in Fort William, Oban and Skye. Maximum of 6 guests staying in Eshaness at one time. 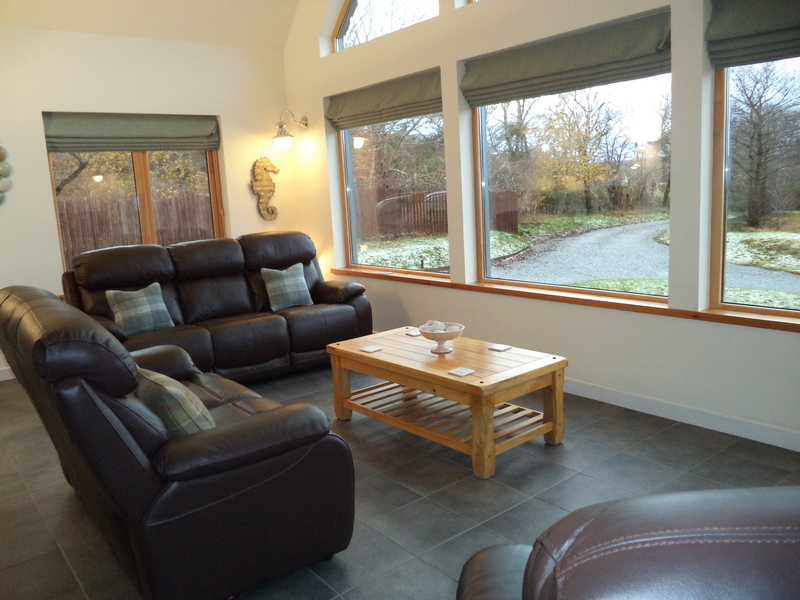 £1150… Easter, Whit Week, June, July, August, September. £950… March, April, May, October. £820… November, December, January & February. Christmas and New Year… please enquire for tariff. Electricity and bed linen are included in the price. 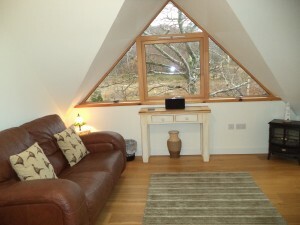 Short breaks are also available off season (minimum of 3 nights). 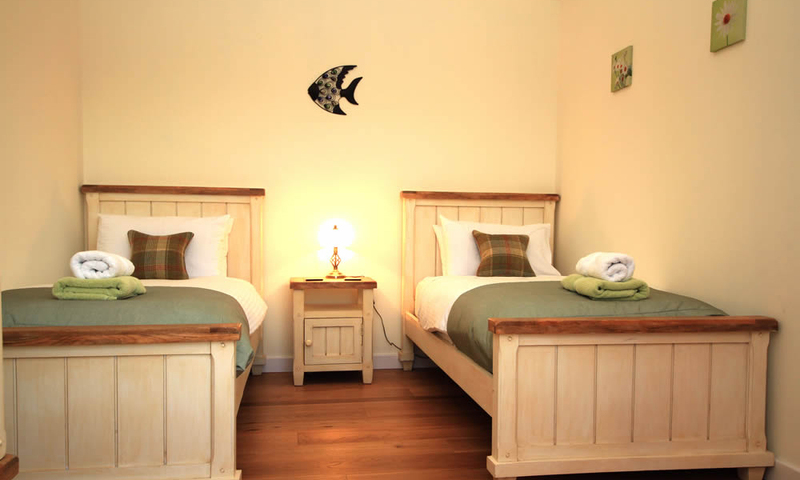 Guests are able to enter Eshaness from 4pm on day of arrival and vacate by 10am on the day of departure. Please leave Eshaness clean and tidy and any breakages paid for. Eshaness is non-smoking. 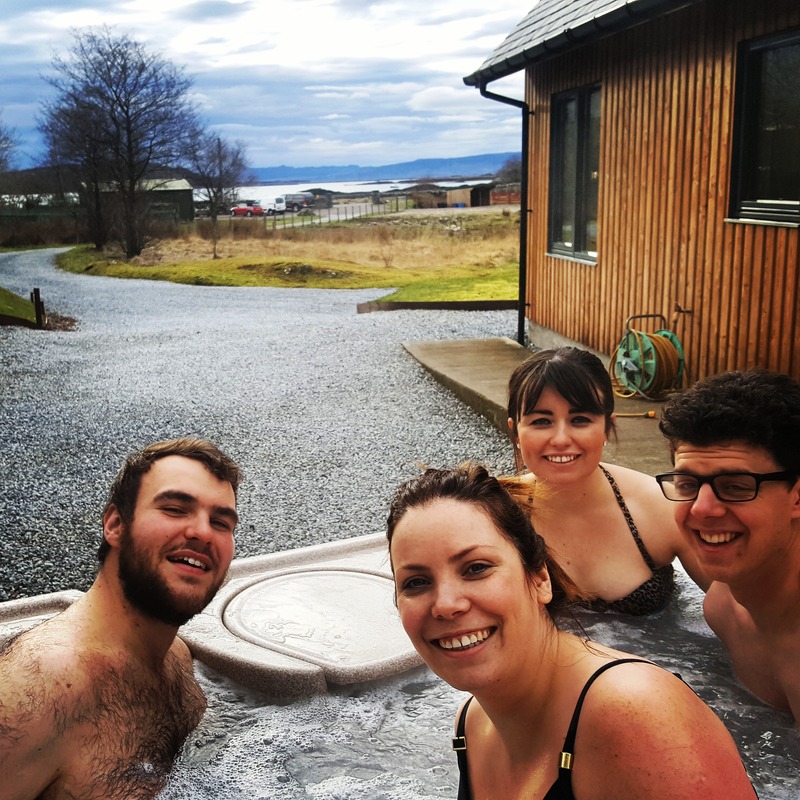 Please ensure children are supervised at all times in the hot tub.